So you’ve taken the plunge! You’ve decided to add a pool to your landscape and now comes the fun part – choosing the design features for your new, blue oasis! Whether your vision is contemporary elegance or you are looking to create a luscious tropical paradise, Groupe Paramount can help to bring your ideas to life. There are so many ways to let your creativity show! Choose from a traditional, free-form, contemporary or natural design style and then customize with design touches that make your pool uniquely you. 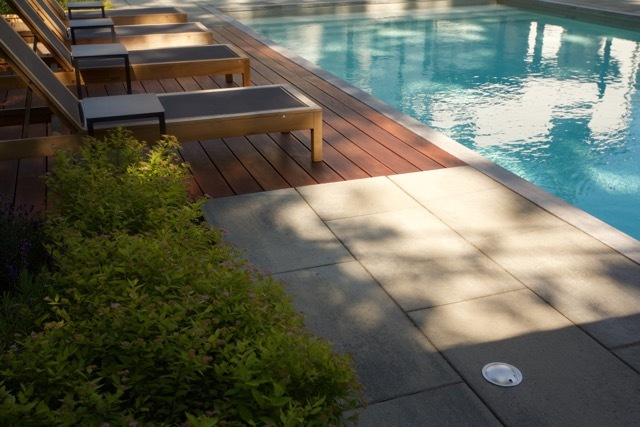 Add custom sun ledges, swim-up bars or negative edges that produce the visual effect of water with no boundary. The options are endless! Selecting your exterior seating is one of the most important decisions of your pool area design. The right outdoor decor can make any pool area more luxurious! We can help you take inspiration from your interior decor or choose pieces that compliment the design aspects of your new poolscape. Set the stage for a dynamic poolscape with a custom decking and paver design! Add a contemporary sun ledge with gorgeous (and durable!) 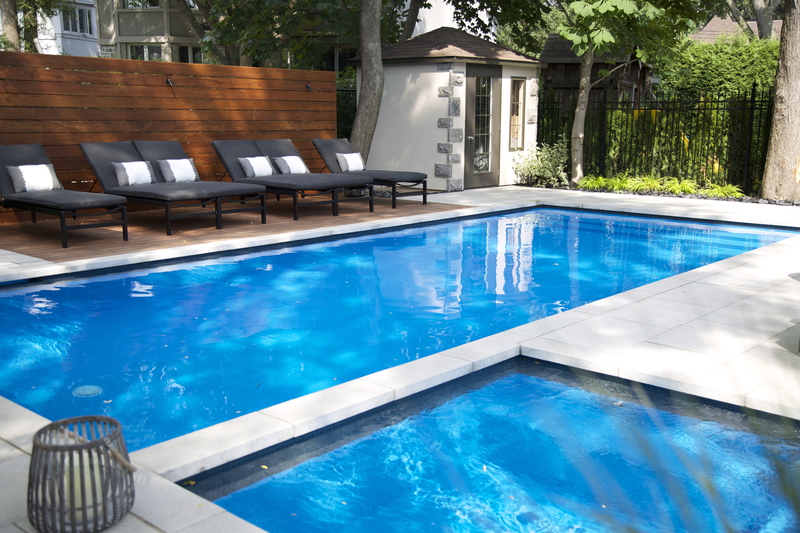 ipe wood, choose from concrete pavers or slabs, or create a secluded haven by adding a feature privacy wall. 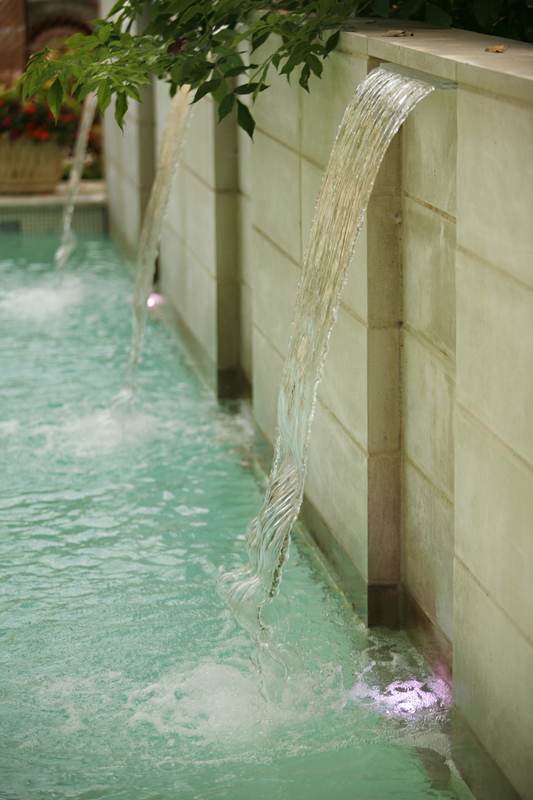 A water feature can increase the sense of calm and tranquility that your oasis provides, as well as adding to the visual aesthetic of your new swimming space. Water features can be designed with natural rock, artificial rock, block or stone structures. 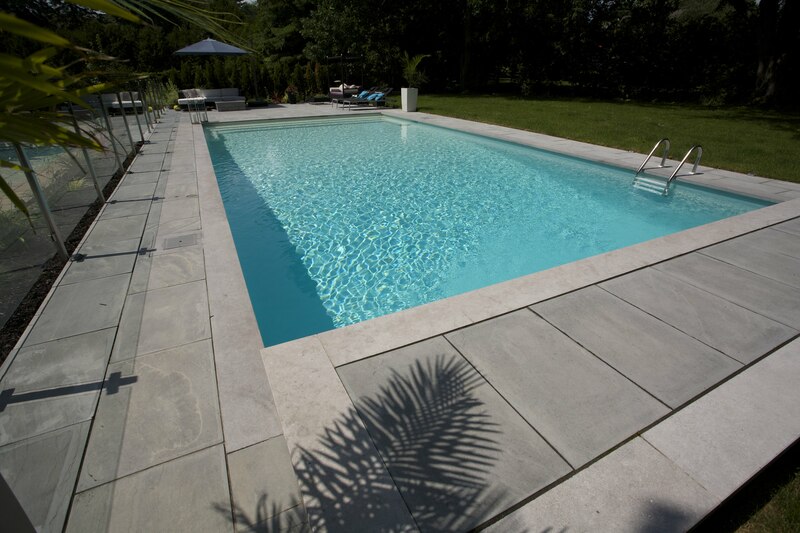 They can be integrated into the poolscape or as a part of the construction of the pool itself. Lighting is everything, whether it’s part of your interior or exterior design! Pool lights can create varying aesthetic effects, depending on the design and colour. From warmer toned yellows, oranges or reds to relaxing greens or blues. Not only will the right lighting enhance the beauty of your poolscape but will also provide safety by aiding visibility underwater, near steps, on pool ledges and seating areas. A custom spa or hot tub is a great addition to any swimming space. They add value to your property and the relaxation benefits are incredible! They also keep your poolscape functional throughout the colder months and are a great way to warm up, polar bear club style, in your very own backyard!